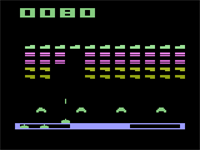 Atari 2600 programmers Erik Mooney and Piero Cavina have released the source code and binaries to their 2600 homebrew game INV+. 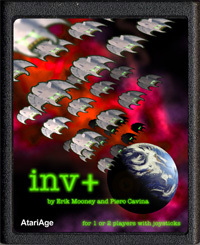 INV+ is an original take of the arcade classic Space Invaders for the 2600 and is the only version of Space Invaders for the 2600 to feature 11 invaders per row, matching the arcade game in this regard. INV+ also features a simultaneous two-player mode. Several additional improvements were made in addition to the above. You can read the complete list of changes here. The source code below provides valuable insight into what it takes to code a successful Atari 2600 homebrew game. Thanks go out to Erik Mooney and Piero Cavina for making this source available so others may benefit from his experience.